Reward the mindset you want with praise in the form of food or pets. These are things we say often, including myself, and they are true and important, but what can get lost is the context of affection when training. For the dogs we see with behavioral issues, they need less affection in general, especially when their dog is calm. Haven’t we all heard that you should only reward a calm dog if a calm dog is what you want? That alone is difficult for most owners, but it isn’t even the whole truth and if taken literally without context, it can actually make things much worse. Victoria Smith from Take the Lead says it best by creating a new saying “leave relaxed dogs alone”. Now she doesn’t mean ALL the time of course, but dogs have so much access to our personal space most of the time that we are giving affection constantly without even realizing it. This creates a dog that associates us with excitement and stimulation in some form as well as constant free handouts without working for it. The dog’s response may be something minor. They are laying down and you go over and pet them or call them over and they respond with a wagging tail, to something more intense like mouthing or whining. Then you try to settle your dog down and they struggle to listen to you when you have created that scenario for the dog, and you represent too much excitement. For many of you, this may not be a big deal, but for the owners I talk with, it is! They deal with over excitement, disrespect, dog can’t listen, to escalating issues like fear, protectiveness, insecurity, aggression, etc. All of those things must be tackled in the most basic way first, and that is to leave relaxed dogs alone. Our affection towards our dogs can be associated with strong emotions that make it difficult for our dogs to cope. If you are doing something more than simple puppy training basics or trick training, keeping your dog aroused is doing more harm than good. The biggest challenge clients face after a board and train is the pattern of arousal that is associated with the owner and the home environment that led to over excitement issues or stress/aggression/fear/separation anxiety in the first place. Then there are often genetic challenges on top of that like protection breeds, etc. What we want to achieve is a natural counter conditioning that creates good endorphins associated with different situations, but it takes time and lots of consistency, where the dog finally relaxes in the home, at the park, etc. The dog will find the positive aspect of this in the fact they are more relaxed in general and have a calmer state of mind associated with that situation. This makes everything easier, including being able to influence their behavior and see trouble spots. After all, you should be the one to crate them or put them in a down or place command (implied stay) in the first place, so you are associated with creating the ‘off’ switch, but you should not disturb it. Imagine if your dog is doing so well and then you or a member of you family goes over to say hello and the dog paws at you, wiggles, kisses you and now wants to do something, is alert, excited, etc. That is not progress, that is using positive reinforcement to hurt training rather than help. You are accidentally teaching your dog to stay alert, not be able to settle, by interacting too much. With MANY dogs we see, just staying in place command and the owners moving around or giving the dog eye contact creates whining, excitement, anxiety, which is all related to stress. All of that is related to any other issues you might be dealing with related to your dog. This is therapy, it’s work, and the dog will learn the reward in it, but you have to let them. To be clear, this is not every dog, but it is all the dogs I see, hear about, help, etc. Dogs associate their humans with excitement through too much arousal, usually in the form of affection. If that is more then 50% of your relationship with your dog (and for most owners it is) it becomes a problem if your dog has behavioral issues of some sort, even if it’s just being disrespectful. You have to look at what you represent to your dog. 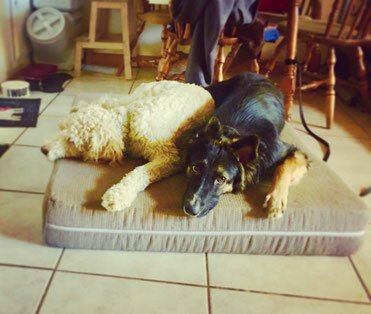 Sharing so much softness makes it impossible to influence your dog’s behavior in a time of need, whether that time of need is an aggressive outburst or fleeing from fear. The biggest question I get and an important one is how long! How long do I give little to no affection and just work on calm state of mind? That is different for every dog and for every human dog relationship. Many factors weigh in. The easiest answer is let your dog tell you. Are the other things going on with your dog greatly improved? Are you able to give your dog affection without them getting super excited? Are you able to pet your dog and they are able to still listen to instruction without fuss? You have to give your dog time to get to the point where they can relax and achieve a happy calmness. This is the natural counter conditioning that affects the brain. Disrupt it too soon or too often and it will disappear. Routine helps to instill guidelines and over time it will become second nature for you and your dog. That means when you are exhausted from work and already cranky from a bad day, you still enforce the stop and sit at the door and check the dogs mental state before heading out. For most of the dogs I see, it’s usually several months, occasionally a few weeks with the easier dogs, and then we gradually add back in affection to see how the dog does with it, but I can’t give you an exact time, only your dog can and how strong you are putting your dog’s needs ahead of your own. If you add aggression issues into the mix, you are looking at some level of permanent change. You have to find out what that means, but first you have to get to that point. I am not saying you can’t have fun, play, etc. My dogs have different levels of freedom based on there age and personalities, but all of them play, get cuddles, etc., but what I am saying is prioritize what you share with your dog depending on the issues you are working on. There is always time for play, but can you create that on and off switch with your dog in situations where they are worried, stressed, over excited, etc. I could seriously eat a delicious pizza, garlic knots, ice-cream and cake every day for a week. PERFECT MEAL! Now I know not everybody could do that, but we all have our vices…could be smoking, etc. BUT the reason I don’t (besides getting fat) is because it makes me feel like crap. By day three (and yes, I know this from trial and error) I feel terrible and my mental state suffers. I can rationalize and have the thought process to know what I did wrong, how to fix it and I just have to find the will power to do it. Dogs can’t do that. They are responding to us, so if we are representing too much excitement or softness that keeps them aroused, they live in that state of mind and cannot get out on their own. You add in some serious behavioral issues with a long history of living with us in that state of mind, and you have some work to do in order to help them and it requires sacrifice on your part.